Xylem Inc. the global water technology company, has further extended its capacity range of closed-vessel, ultraviolet (UV) disinfection solutions for wastewater, industrial and water reuse applications with the launch of the WEDECO LBXe 850 and 1500. Optimised for large-scale applications, Xylem’s WEDECO LBX series is energy-efficient and has been fully validated according to the US Environmental Protection Agency’s UV Disinfection Guidance Manual (USEPA’s UVDGM 2006). It has also been validated according to the National Water Research Institute (NWRI) 2012 guidelines by independent, industry-leading Carollo Engineers. 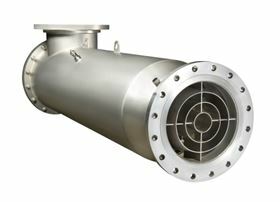 The new LBXe 850 and 1500 models strengthen Xylem’s portfolio in the higher flow rate ranges and meet an increasing demand for UV solutions for large-scale water reuse projects. Capable of handling peak flow rates up to 2120 m³/h (8.5 MGD) per reactor the LBX 1500 will be one of the largest validated closed-vessel, low-pressure lamp wastewater systems in the industry. Both new LBXe units feature an ‘OptiCone flow diverter’which channels the flow evenly across the lamps to maximize disinfection efficiency and come in the “L” configuration for easier installation.